COQUITLAM — Sammy Shields and Jessica Parker are more of a dynamic duo to deal with than ever before. That’s why on Friday it took everything that Walnut Grove’s Tavia Rowell had to offer for Langley’s Gators to finally overcome Shields, Parker and the rest of Port Coquitlam’s Riverside Rapids in the first of two semifinal games at Centennial Secondary’s 2019 Top 10 Shoot Out invitational in Coquitlam. 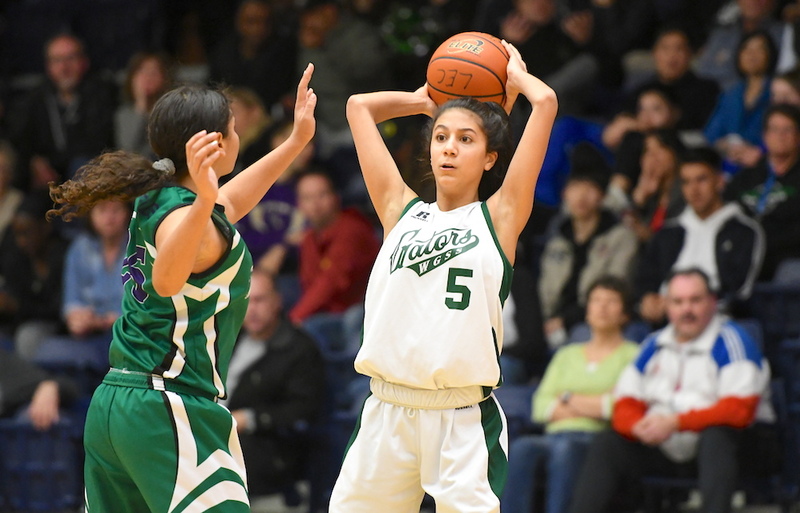 “Tavia stepped up against pressure, attacked the rim and created open looks for the girls,” agreed Gators’ head coach Darren Rowell of her Grade 12 daughter, who went on to finish with a team-high 26 points and was one of five double-digit Walnut Grove scorers on the night. Tavia Rowell, in fact, had just four points at the half, a total that resulted from a pair of primary tasks: Breaking Riverside pressure and on defence, guarding Riverside’s Parker. Walnut Grove pulled Rowell off of Parker, replacing her with Grade 10 Sophia Wisotzki, the same player who last March, as a Grade 9, was named Top Defensive Player at the B.C. senior girls AAA championships. While there was no such thing as stopping Parker, who finished with 27 points (14 first half, 13 second half), the huge key was freeing Rowell to become a scorer when here team needed it most. Rowell’s response was to score 22 of her 26 in the second half. In the third quarter, she did it through contact and getting to the rim, going 5-of-6 from the stripe over the frame. Then, in the fourth, she scored the basketball a half-dozen times from the field for an old-fashioned dozen points. 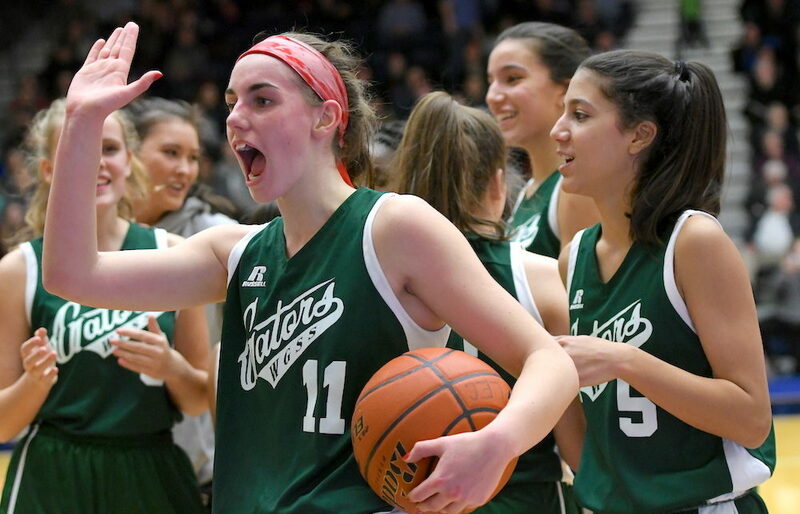 “It felt like a 15-round boxing match,” said Darren Rowell, whose Gators advance to face the winner of the second semifinal between Brookswood and Semiahmoo on Saturday in the tournament final. Shy of Walnut Grove’s game-closing 6-0 run, simple math tells you this was a barn-burner. Riverside led 76-75 down the stretch drive, and then trailed 81-79 before the Gators’ closing salvo. For the Rapids, Parker’s 27 points along with a game-high 29 from Shields, did the majority of Riverside’s damage. Alanya Davignon added nine points, while Tessa Burton and Adrienne Willems scored seven apiece. Shields scored 18 of her 29 points in the second half. The Gators, of course have a superb 1-2 punch of their own, and the other half of their duo — Jessica Wisotzki — was as consistently excellent as usual, finishing with 24 points. Senior Rolande Taylor added 14 points, and her Grade 9 sister, reigning B.C. Junior MVP Fania Taylor, scored 10 points.